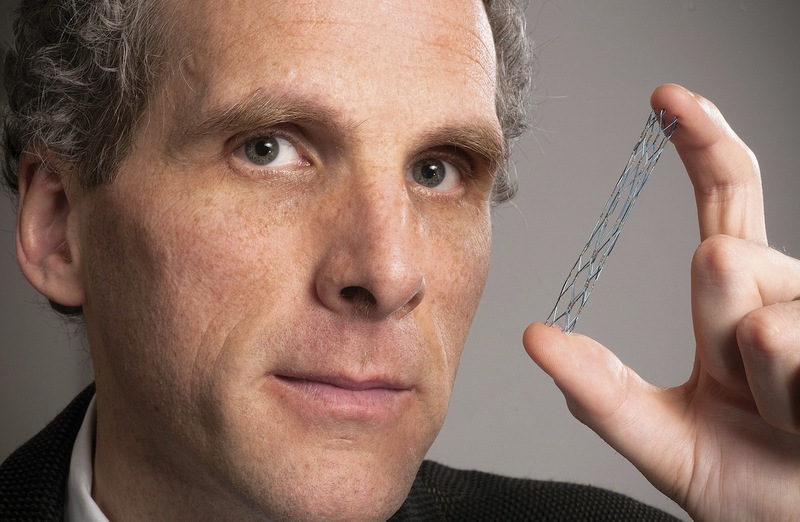 David Jones holds a vascular stent (from the Warren Anatomical Museum), designed circa 1995 by radiologist Morris Simon of Harvard Medical School. Three bypass arteries connect the aorta to smaller coronary arteries on the heart’s outer surface. In angioplasty, a catheter sheathed by a deflated balloon is inserted (left) into an artery (red) clogged with plaque (yellow). When inflated (center), the balloon crushes the plaque into the walls of the artery and expands the wire mesh stent. The balloon is then deflated and removed, leaving the stent in place (right) to hold the artery open. For millennia, people experienced angina pectoris and heart attacks, but it wasn’t until the 1910s and 1920s that physicians began concerted efforts to discover their biological causes. During the twentieth century, heart disease began to climb from relative obscurity to its now longstanding status as the leading cause of death for American adults. It has held that position every year except those between 1918 and 1920, when it yielded to the influenza pandemic. Yet cardiac care in 2013 is dramatically more advanced than it was in 1910—isn’t it? In his new book, Broken Hearts: The Tangled History of Cardiac Care (Johns Hopkins), David S. Jones ’92, M.D. ’97, Ph.D. ’01, Ackerman professor of the culture of medicine, narrates the history of two of American medicine’s highest-profile treatments for heart disease: coronary artery bypass grafts and angioplasty. Each intervention, promising lifesaving relief, was embraced with enthusiasm by cardiologists and cardiac surgeons—and both techniques often do provide rapid, dramatic reduction of the alarming pain associated with angina. Yet, as Jones painstakingly explains, it took years to show whether the procedures prolonged lives; in both cases, subsequent research deflated those early hopes. The interventions—major procedures, with potentially significant side effects—provided little or no improvement in survival rates over standard medical and lifestyle treatment except in the very sickest patients. From his detailed study, Jones draws broader conclusions about the culture and practice of modern medicine. Within cardiac care, examples of medical intervention include surgical procedures, such as coronary bypass operations, and invasive treatments like angioplasty. Coronary bypass has the longer history, traceable to 1910, when one surgeon made an (unsuccessful) attempt to perform bypass surgery on a dog. But it wasn’t until 1968 that Rene Favaloro of the Cleveland Clinic described his success with human coronary artery bypass surgery: he grafted a vein taken from the patient’s leg into the heart’s vascular system to replace a blocked coronary artery. Favaloro’s report captured the imagination of many surgeons. Initially they operated on stable patients with modest coronary artery disease. 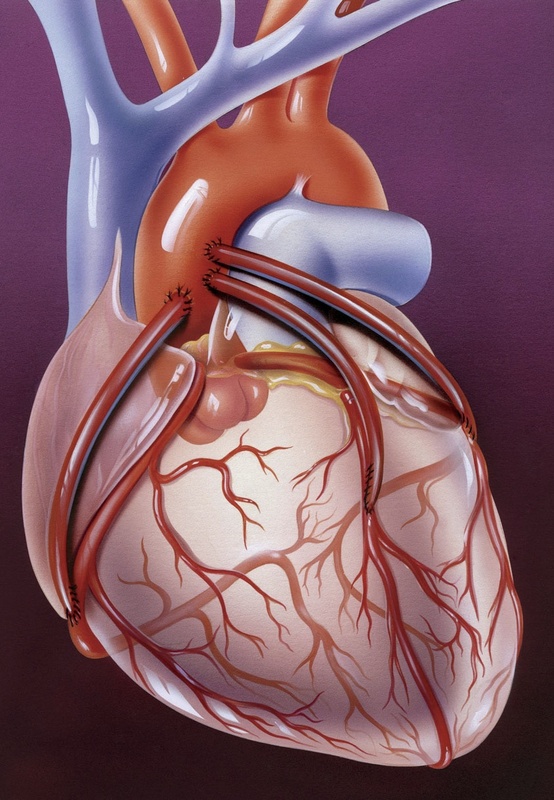 Within a few years, however, as surgeons became more adept at slipping new veins into the heart vasculature, they operated on ever-sicker patients, and even dared to operate during heart attacks. The holy grail soon became clear: act preemptively and operate before a heart attack occurs. By 1977 cardiac surgeons were performing 100,000 bypass procedures per year; the operation’s popularity peaked at 600,000 instances in 1996. Since then, patients like Bill Clinton and David Letterman have kept the procedure in the limelight. The advent of angioplasty in the 1980s complicates the story. With angioplasty, instead of bypassing the plugged artery, “you use a balloon to compress the plug,” Jones explains, “and (as it’s done today) you leave a stent behind to keep the blood vessel open, and so restore blood flow to the heart.” Like bypass surgery, angioplasty went from zero to 100,000 procedures annually with no clinical trial to assess long-term outcomes—based on the logic of the procedure and patients’ reports of how much better they felt. Yet the first clinical trials, which appeared in the early 1990s, showed no survival benefit of elective angioplasty as compared with medication. He was moved to pursue a Ph.D. in the history of science to complement his medical degree. Jones’s historical eye allowed him to view medicine through a slightly different filter than his peers, perhaps suggesting a more critical view of why doctors do what they do. His early research parsed the epidemics that decimated the American Indians, an analysis that he expounded in his 2004 book Rationalizing Epidemics: Meanings and Uses of American Indian Mortality Since 1600. Analyzing the cycle of diseases that devastated the Native American population, from smallpox to tuberculosis to today’s chronic ailments of obesity, diabetes, and heart disease, Jones argued that rather than simply reflecting differences in immune tolerances to certain pathogens and lifestyles, the epidemics also grew from a web of complex social forces—including forced migration, the changing economic circumstances of displaced native populations, and cultural practices that gave the diseases deadlier power among American Indians. In Broken Hearts, Jones describes the historic methodological struggles within the medical profession as doctors tried to identify the causes of heart attacks. Beginning in the early 1900s, when the first cases of heart attack were identified in the medical literature, physicians have struggled to explain why hearts fail so suddenly. Understanding the why can in turn reveal how heart attacks occur. Doctors hoped that would lead to the most effective ways to fix the problem. But one of the dirty secrets of cardiac care, says Jones, is that until the 1970s, heart experts could not agree on what was causing heart attacks, rendering their interventions equal parts gamble and trial-by-doing. As reports of heart attacks began to populate the medical literature, competing theories about their cause emerged. The sudden nature of the attacks led some doctors to assume that random spasms of coronary arteries might be responsible. Without any window into the living heart, however, this theory was supported only by evidence of similar twitches in the blood vessels found in rabbits’ ears, for example, and by the fact that not all heart-attack patients showed signs of lesions or clots in their cardiac blood vessels on autopsy. Another popular theory involved clots obstructing blood flow to critical coronary arteries; this fueled the appearance of blood-thinning agents such as heparin as a common treatment for heart-attack patients by the 1950s. But an equally compelling theory was also emerging, one that had actually been described in an autopsy report back in 1844 that mentioned “several atheromatous lesions, of which a rather significant one was ulcerated and the atheromatous mass extruded into the arterial lumen.” Published in a seldom-read source—the Journal of the Danish Medical Association—the account received little attention, but in the 1930s, the medical examiner of Boston made similar observations and developed the theory of plaque rupture. Heart attacks, according to his idea, happened when atherosclerotic plaques, embedded in the coronary arteries, ruptured and triggered blood clots (thromboses) that blocked blood flow. Confirmation came in the 1960s when pathologists painstakingly sliced and analyzed coronary artery specimens from patients who died of heart attacks: fatal coronary thromboses were nearly always associated with ruptured plaques. Although initially assumed to be an affliction of the wealthy elite, by the 1930s and 1940s, heart disease was increasingly recognized among men of all social and economic strata. “This led to a new concern: if someone was working on the assembly line and doing physical labor and had a heart attack, he would be eligible for workers’ compensation,” says Jones. As employers wrestled with finding the right balance of financial responsibility that would not leave them bankrupt, many responded by shifting accountability back to the workers, exempting heart attacks from workers’ compensation to free themselves from a potentially enormous financial burden. But, as Jones says, heart-bypass surgery was a classic case of “learning by doing.” Only as more patients went under the knife could doctors know for sure whether such interventions were actually making a difference in their lives. Much of what justified the first surgeries relied on the assumption that obstructions in heart vessels needed to be cleared; the evidence for this theory rested on autopsy data and animal models of the disease—neither of which, most physicians will agree, are ideal substitutes for the human body. Indeed, Jones, says, the seductive logic behind the procedure may have blinded doctors to some serious questions about its safety and efficacy. Angioplasty emerged on the heels of bypass surgery when a German cardiologist, Andreas Grüntzig, devised a way to thread a catheter from a groin artery into the heart in 1977. Initially, doctors performed angioplasty on patients with stable coronary artery disease; cardiologists were cautious about how useful angioplasty alone would be as a treatment for heart-attack patients. Grüntzig predicted it could substitute for bypass for at most 15 percent of patients who were candidates for surgery. But it didn’t take long for cardiologists to begin seeing themselves, as a profession, in competition with cardiac surgeons over treating heart patients. Surgery to treat heart attacks was becoming a booming business, pulling in millions in revenue at a typical cost of $10,000 to $15,000 per procedure. Buoyed by the emerging data from the late 1970s onward showing that bypass surgery did not necessarily confer any survival benefit, cardiologists focused on the advantages of angioplasty over surgery: no operation to open the chest, only a small incision in the groin, and a faster recovery time. These benefits were concrete and immediately evident, but cardiologists didn’t know whether angioplasty would improve outcomes to a degree comparable to bypass surgery. Still, the intuitive sense of angioplasty’s lower risk catalyzed a growth spurt from 133,000 procedures in 1986 to more than a million performed annually by the 2000s, forming (together with bypass surgery) a $100-billion industry today. The problem with balloon angioplasty was re-stenosis: the plaques would re-form within a few weeks of the procedure. 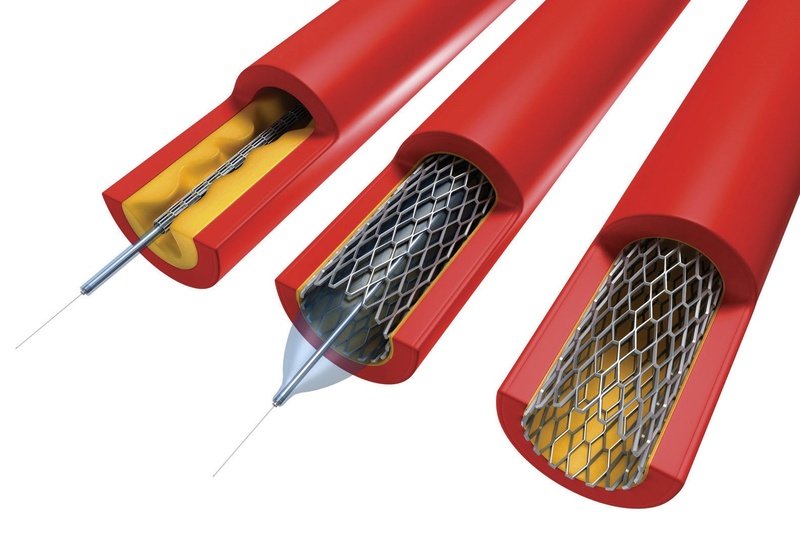 But given the visual evidence of plaque, the belief that dealing with it had to translate into some health benefit drove another innovation in angioplasty: the development of stents designed not only to temporarily compress plaques in partially blocked arteries but to prop them open more persistently with mesh-like devices that acted like scaffolding for the vessels. In theory, stenting would prevent re-stenosis. When faced with evidence that the placement of a foreign object in the vessel walls could itself promote thrombosis, and with recalls of stents that sometimes snapped shut, cardiologists and device-makers simply turned to more flexible materials and laced the stents with drugs that resisted buildup of thrombus. In 2007, a study of more than 2,000 patients with stable coronary disease showed that compared to drug therapy alone, stents in combination with drug therapy such as blood-pressure medications and cholesterol-lowering agents did not lower the risk of having a heart attack or improve survival during a seven-year follow-up period. But instead of curbing stent use, two years later, a survey showed that the share of patients receiving drug therapy merely as a first-line treatment, before getting stents, remained unchanged at 44 to 45 percent. Consider, for example, breast and prostate cancer. After doctors and health officials convinced the public that routine screening is the most effective way to detect tumors early, mammograms and prostate-cancer tests became mainstays of routine physical exams. But the U.S. Preventive Services Task Force recently conducted evidence-based reviews of the benefits of such screenings, assessing lives saved against the risks of complications and false positives that the screenings generate. For women under 50, the panel concluded, the risks of unnecessary biopsies and potential infections caused by yearly mammograms outweigh the benefits of the procedure; the panel recommended that women begin screening not at 40 as previously recommended, but at 50. Similarly, an analysis of the prostate specific antigen (PSA) blood test to detect early signs of prostate cancer did not show a significant survival advantage, and the task force issued the seemingly stunning recommendation that no men, unless they have a history of prostate cancer, be screened with the PSA test. Advocates and patients immediately criticized the guidelines, citing the inevitable deaths that would occur as people eschewed screening and visited their doctors only when treatment could do little to halt the disease. The American Urological Association continues to push for regular PSA screening, a position that many patients support as well, given the intuitive belief that action is better than inaction. Alice Park is a staff writer at Time.